Edema is an abnormal presence of excessive fluid in the interstitial space. 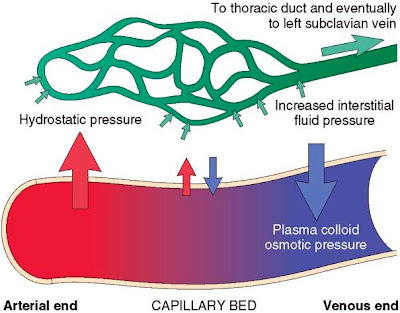 The movement of water and low molecular weight solutes such as salts between the intravascular and interstitial spaces is controlled primarily by the opposing effect of vascular hydrostatic pressure and plasma colloid osmotic pressure. Normally the outflow of fluid from the arteriolar end of the microcirculation into the interstitium is nearly balanced by inflow at the venular end. A small residual amount of fluid may be left in the interstitium and is drained by the lymphatic vessels, ultimately returning to the bloodstream via the thoracic duct. Either increased capillary pressure, diminished colloid osmotic pressure or inadequate lymphatic drainage can result in an abnormally increased interstitial fluid i.e. edema. An abnormal increase in interstitial fluid within tissues is called edema, while fluid collections in the different body cavities are variously designated hydrothorax (pleural cavity), hydropericardium (pericardial cavity) and hydroperitoneum (the last is more commonly called ascites). Anasarca is a severe and generalized edema with widespread subcutaneous tissue swelling. The diagram above shows the actual change in pressure gradients at the capillary level. The numbers represent the pressure in the vessels in mmHg. 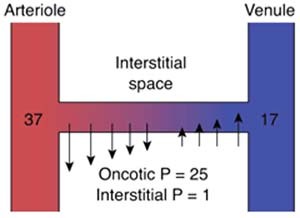 At the arteriolar end, the hydrostatic pressure (outward force) is 37 mmHg while the oncotic pressure and interstitial pressure (inward forces) are 25 and 1 mmHg respectively. Thus the net outward force is 37 – (25+1) = +11 mmHg. Since the net outward force is positive fluid moves from the capillary to the interstitial spaces. At the venular end, the hydrostatic pressure is lower and has a value of 17 mmHg. The oncotic and interstitial pressure on the other hand remain the same i.e. a total of 26 mmHg (25+1). Thus the net outward force is 17 – (25+1) = -9 mmHg. Since the outward force is negative, it means fluid is not getting out of the capillary but instead it is moving into it. The arrows in the diagram show the magnitude and direction of net fluid movement. It means that the edema is localized to a specific region of the body. It is commonly due to venous/lymphatic causes, allergy and inflammation. 1) Venous edema: It is due to high venous pressure or venous constriction. Intravascular venous obstruction e.g. Deep vein thrombosis (DVT) or an external compression like a mass (tumour) or plaster are the common causes but there can also be failure of venous pumps due to paralysis of muscles (Cerebro-vascular accident), immobilization of parts of the body (Post-op, fractures) and failure of venous valves (Varicose veins). It is more frequent to see localized edema in the lower limbs but the upper limbs may also be affected. 2) Lymphatic edema: It is due to a blockage in the lymphatic return. It commonly occurs in conditions like cancer/ post-radiation, infections like elephantiasis (Filaria nematodes), surgery or congenital absence or abnormality of lymphatic vessels. The edema is persistent and non-pitting type. In case of elephantiasis, the affected limb may be dramatically enlarged. 3) Allergy/Angioedema (Quincke edema): During a case of allergy there is release of histamine and other mediators that lead to vasodilation. The swelling can involve the face, lips, tongue and even glottis. Edema of the glottis is a medical emergency as it can lead to asphyxia if not treated quickly. This type of edema is usually itchy but transitory. It resolves with antihistaminics and steroids. 4) Inflammation: Here also there is vasodilation because of the inflammatory mediators. Edema is seen with superficial (cellulitis) or deep infections (abscess). In this case the edema involves more than 1 part of the body simultaneously. It is commonly due to cardiac, hepatic, renal or endocrine causes. 1) Cardiac edema: The initial pathology is because of increased venous pressure but as the condition becomes more severe, there is impairment of renal blood supply, activation of rennin-angiotensin-aldosterone system and finally hypoalbuminemia secondary to liver stasis. Left sided heart failure leads to pulmonary edema while right sided heart failure causes peripheral edema, ascites, hydrothorax and anasarca in severe and long standing cases. The edema is progressive. In ambulant individuals, it moves up with severity. The edema is usually of pitting type. In early stages of heart failure, there is improved renal circulation at night leading to nycturia. Thus the edema will be less in the morning and progressively increases towards the end of the day. 2) Hepatic edema: Liver pathology like cirrhosis leads to decreased synthesis of proteins. The hypoalbuminemia leads to decreased oncotic pressure. The scarred liver also causes a back pressure in the portal vein territory (portal vein hypertension) and increases the hydrostatic pressure there. These 2 factors combined lead to edema in the peritoneal cavity (ascites) and this in turn compresses the inferior vena cava and leads to edema in the lower limbs. 3) Renal edema: Kidney diseases like nephritic syndrome with decreased glomerular filtration rate and sodium/water retention or nephrotic syndrome where there is albumin loss in the urine lead to generalized edema. The edema frequently occurs in lax connective tissue like the face, periorbital area and genitalia. It is of pitting type. It occurs mostly during the morning and is associated with vasoconstriction. Thus it is called as ‘white’ edema. 4) Endocrine edema: Many endocrine problems can cause edema. In case of hyperaldosteronism (primary or secondary), there is retention of sodium and water. This leads to an increase in hydrostatic pressure. The edema is of pitting type. On the other hand, myxedema refers to a non-pitting type of edema seen in hypothyroidism. Finally, females experience edema as part of the pre menstrual syndrome due to hormonal changes. In dependent edema, which is typically present in congestive heart failure and in conditions associated with a low plasma protein level, the swelling first appears at the ankles and over the dorsum of the foot and only gradually involves the legs, thighs and trunk. The best place to check for slight degrees of edema in an ambulant patient is behind the malleoli at the ankles. In bed-bound patients edema often appears first over the sacrum. To recognize pitting edema it is important to press firmly and for a sustained period of 20-30s over a bony prominence (tibia, lateral malleoli or sacrum) to provide effective compression. The 'pit' will be as easily felt as seen. If the finger pressure is not maintained for an adequate period of time then slight degrees of edema may be overlooked. Edema can be recognized by the pallid and glossy appearance of the skin over the swollen part, by its doughy feel and by the fact that it pits on finger pressure. The edema of lymphatic obstruction does not pit on pressure or there may be minimal pitting. The skin is usually thickened and tough. 1) Without redness and scaling, bilateral periorbital edema may indicate acute nephritis, nephrosis or trichinosis. If there is irritation, contact dermatitis is the probable diagnosis. 2) In local venous obstruction the edema is confined to the parts from which the return of blood is impeded. Local edema is sometimes seen over inflamed joints. 3) Edema of the whole upper part of the body may result from intrathoracic tumours. a more noteworthy or lesser degree, on the outside of almost all weaved textures. Their quality defaces the presence of weaved pieces of clothing,https://tadalafilgen.com/ giving them a drained, worn, not well thought about look. Things being what they are, what would you be able to do about pilling? so many online pharmacy stores are having their websites in internet. You need to visit their website and fill a form and email your prescriptions.